When shopping for a wedding dress, the wide variety of dress types available can overwhelm you. The situation could be much worse if you can’t identify a particular style or tell the difference between it and another. 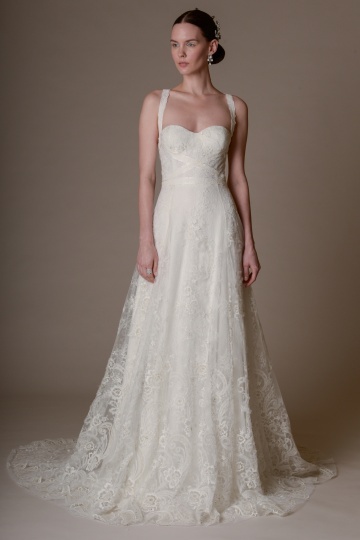 Knowledge is power when it comes to finding the most flattering wedding dress. We’ve decided to make things easier for you by giving you information on the different wedding dress silhouettes available. Don’t start your hunt before reading this simple but comprehensive guide. The empire-line gown has a raised waistline that starts just under the bust line and flows all the way down to the hem. This style skims over the tummy area and hips to form a straight flow that is ideal for camouflaging trouble spots like short legs and a long torso. It is perfect for pear-shaped brides. The empire style gown is also suitable for pregnant brides because its fluidity nicely accommodates a large belly. The A-line silhouette features a fitted bodice and a skirt that gradually flows out to the ground from below the waist, resembling the outline of the letter ‘A’. It is highly popular because of how flattering it is for almost all shapes. It can make petite brides look taller, create curves for brides with straight figures, downplay a wide waistline and hide lower body flaws. You can modify the fabric, neckline or waistline to emphasize your best assets while hiding your less impressive features. The A-line gown suits any occasion, from a traditional church to a backyard ceremony. The trumpet gown, sometimes called the fit-and-flare, fits tightly to your body and begins to flare gradually around your mid-thigh. The gradual flare of the skirt resembles the shape of a trumpet’s bell. It is usually confused with the mermaid gown. The two are similar, but the mermaid is more fitted than the trumpet. The trumpet silhouette adds a nice balance of chic and classic to your dress design. It is excellent for accentuating curves. The mermaid gown tightly embraces the body’s contours from the chest to the knees, or lower, then dramatically flares out to the hem, resembling a fin. It flatters brides with slender figures. Those on the voluptuous side can also use it to accentuate their curves. However, regardless of how perfect your figure is, you should consider whether or not you’ll be comfortable wearing the mermaid style for your wedding. It has a bold design that highlights all curves, so you’ll need to be confident to pull it off. 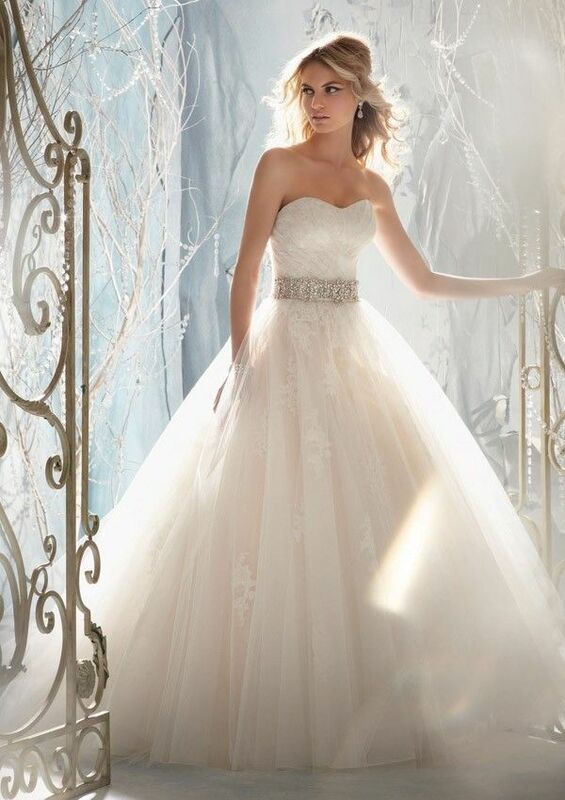 The ball gown style adds a fairytale touch to your wedding. It features a fitted bodice with a dramatic full skirt. It is figure-flattering for most bodies. It is particularly excellent for brides with large busts as it emphasises the waistline, creating an hourglass figure. It is also ideal for pear-shaped and slender figures because it accentuates the waist and conceals any lower-body problem areas. The ball gown wedding dress often features layered tiers, delicate embroidery and elaborate beading embellishments. There are many variations and design opportunities that give you room to make the style suit your preferences. The sheath dress is closely fitted and hugs the body from the head to toe. If you like simplicity, you can opt for this dress. It shows off your figure without any superfluous details. 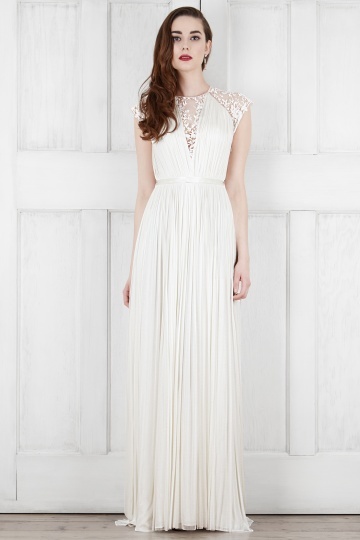 Its straight, slender lines make petite brides look taller. It is a good choice for brides looking to accentuate slim hips or long legs. It can also nicely frame an hourglass-shaped body. A point to note is that the sheath silhouette will draw the eye to every curve, even those you’d like to hide. As you look for a silhouette that flatters your body, we’d advise you to try different dress styles. Whatever your final choice, just know you’ll look spectacular because of all the happiness attached to your big day. Don’t stress!